When we were kids, people would actually toss bags of fast-food trash right out their car windows. Recycling was unheard of, and only the real carob-eating hippie freaks knew what compost was. Things started small, but suddenly the streamroller of "Keep America Beautiful" was chugging through the land. We were taught not to be a litterbug (don't make that Indian cry!) and not to pollute. His snappy slogan since been replaced with another weirdly rhyming slogan "Lend a hand--care for the land!" Yeah. I like ours better. 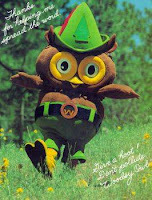 But the giant yellow outlines around Woodsy's eyes kinda freak me out. Yes this is outdated! I noticed Woodsy the owl throwing away what looks to be an aluminum can...in the TRASH vs. the recycling bin.